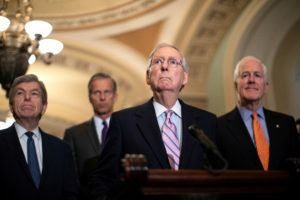 WASHINGTON (AP) — Senate Majority Leader Mitch McConnell set a crucial threshold vote for Friday on Brett Kavanaugh’s tottering Supreme Court nomination, moving his polarized chamber toward a potential confirmation roll call over the weekend that would determine which party wins an election-season battle royale that has consumed the nation. The report was arriving at a Capitol palpably tense over the political stakes of the nomination fight and from aggressive anti-Kavanaugh protesters who have rattled and reportedly harassed senators. Feeding the anxiety was an unusually beefy presence of the U.S. Capitol Police, who were keeping demonstrators and frequently reporters at arms length by forming wedges around lawmakers walking through corridors. Lawmakers were making plans to begin reading the FBI report early Thursday.